In The Price of the Ticket, Harris puts Obama's career in the context of decades of black activism, showing how his election undermined the very movement that made it possible. The path to his presidency began just before passage of the 1965 Voting Rights Act, when black leaders began to discuss strategies to make the most of their new access to the ballot. Some argued that black voters should organize into a cohesive, independent bloc; others urged a more race-neutral approach, working together with other racial minorities as well as like-minded whites. This has been the fundamental divide within black politics ever since. At first, the gap did not seem serious. But the post-civil-rights era has accelerated a shift towards race-neutral politics. Obama made a point of distancing himself from older race-conscious black leaders, such as Al Sharpton and Jesse Jackson--even though, as Harris shows, he owes much to Jackson's earlier campaigns for the White House. Unquestionably Obama's approach won support among whites, but Harris finds the results troublesome. The social problems targeted by an earlier generation of black politicians--racial disparities in income and education, stratospheric incarceration and unemployment rates, rampant HIV in black communities--all persist, yet Obama's election, ironically, marginalized them. Meanwhile, the civil-rights movement's militancy is fading from memory. 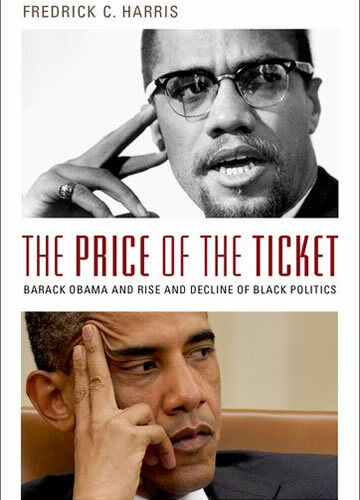 Written by one of America's leading scholars of race and politics, The Price of the Ticket will reshape our understanding of the rise of Barack Obama and the decline of a politics dedicated to challenging racial inequality head on.